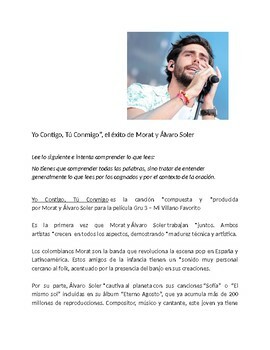 Why not switch things up with a reading about Álvaro Soler ( Barcelona) & Morat ( Colombia) and one of their songs that students enjoy. 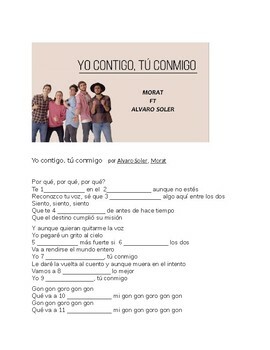 *This song activity is designed to help students recognize the present tense and other Spanish 1 words used in context. Students fill in the missing present tense conjugations. 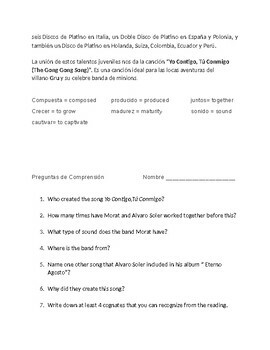 I have included comprehension questions in both Spanish and English so that you may choose which you prefer for your learners. 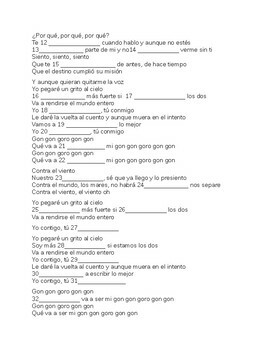 *This song is ideal for 1st year students and the blanks are in the present tense. *** This is a nice, uplifting type tune. My students really enjoy learning through music and it's great for listening comprehension. To get my latest products at a discount, please go to my store and click on the star.